How this adds up to the conclusion appearing in the title is perhaps something of a mystery. The process is not exactly a shining example of how to turn source data into actionable information. There are a number of problems with this logic. To address just one, the failure of Lehmans did not cause the recession, it precipitated problems that were much larger, had been building up for years and which would have been triggered by something sooner or later (all balloons either deflate or pop eventually, even if not pierced by a needle). By way of analogy, thinking that the assassination of Archduke Ferdinand was the sole reason for the outbreak of The Great War would be an over-simplification of history; greater forces were at work. Does a dropped match [proximate cause] lead to a massive forest fire, or are the preceding months of drought [distal cause] more to blame, with the fire an accident waiting to happen? To most observers the distal causes of the recession were separate bubbles that had built up in a variety of asset classes (e.g. residential property) that were either going to deflate slowly, or go bang! Leverage created by certain classes of financial instruments made a bang more likely, but these instruments themselves did not create the initial problems either. Extending our earlier analogy, if the asset bubbles were a lack of rain, then maybe the use of financial instruments – such as collateralised debt obligations – was a drying wind. In this scenario, Lehman Brothers was the dropped match, nothing more. If it wasn’t them, it would have been another event. So for causes of the World Economic crisis, we need to look more broadly. [Certain leading economists] argue that [other] economists missed the origins of the crisis; failed to appreciate its worst symptoms; and cannot now agree about the cure. In other words, economists misread the economy on the way up, misread it on the way down and now mistake the right way out. On the way up, macroeconomists were not wholly complacent. Many of them thought the housing bubble would pop or the dollar would fall. But they did not expect the financial system to break. Even after the seizure in interbank markets in August 2007, macroeconomists misread the danger. Most were quite sanguine about the prospect of Lehman Brothers going bust in September 2008. One thing we are not going to have, now or ever, is a set of models that forecasts sudden falls in the value of financial assets, like the declines that followed the failure of Lehman Brothers in September. This is nothing new. It has been known for more than 40 years and is one of the main implications of Eugene Fama’s “efficient-market hypothesis”, which states that the price of a financial asset reflects all relevant, generally available information. If an economist had a formula that could reliably forecast crises a week in advance, say, then that formula would become part of generally available information and prices would fall a week earlier. My general take is that if the people who were committing organisations to collateralised debt obligations and other even more esoteric asset-backed securities were unable (or unwilling) to understand precisely the nature of the exposure that they were taking on, then how could this be reflected in BI systems. Good BI systems reflect business realities and risk is one of those realities. However if risk is as ill-understood as it appears to have been in many financial organisations, then it is difficult to see how BI (or indeed it’s sister area of business analytics) could have shed light where the layers of cobwebs were so dense. As an aside, the above-referenced article argues that IT professionals should not try to distance themselves too much from business problems. My basic thesis being that if IT is shy about taking any responsibility in bad times, it should not be surprised when its contributions are under-valued in good ones. However this way lies a more philosophical discussion. My opinion on why questions about whether or not business intelligence predicted the recession continue to be asked is that they relate to BI being oversold. Oversold in a way that I believe is unhealthy and actually discredits the many benefits of the field. The above slide is taken from my current deck. My challenge to the audience is to pick the odd-one-out from the list. 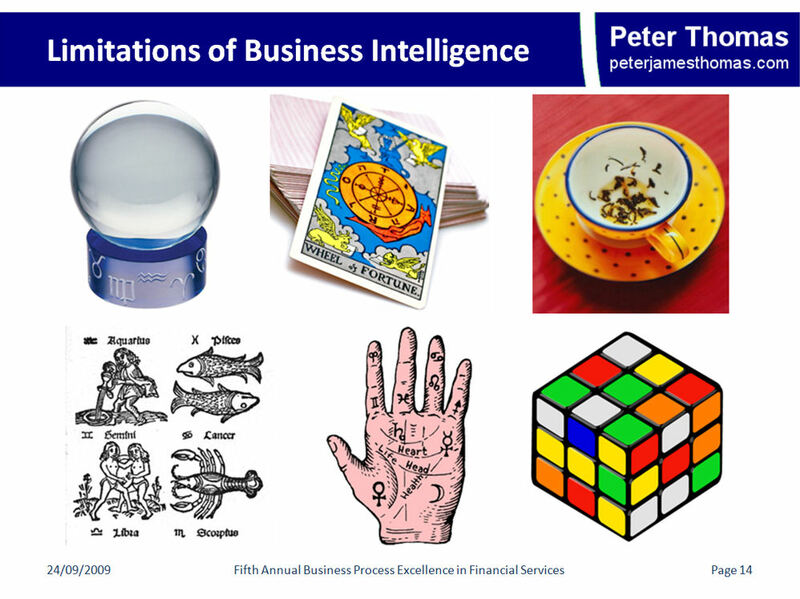 Assuming that you buy into my Rubik’s Cube analogy for business intelligence, hopefully this is not an overly onerous task. Business Intelligence is not a crystal ball, Predictive Analytics is not a crystal ball either. They are extremely useful tools – indeed I have argued many times before that BI projects can have the largest payback of any IT project – but they are not universal panaceas. Illustrating the fairly obvious fact that uncertainty increases in proportion to time from now. Business Intelligence will never warn you of every eventuality – if something is wholly unexpected, how can you design tools to predict it? Statistical models will never give you precise answers to what will happen in the future – a range of outcomes, together with probabilities associated with each is the best you can hope for (see above). Predictive Analytics will not make you prescient, instead it can provide you with useful guidance, so long as you remember it is an prediction, not fact. However, in most circumstances, the fact that your Swiss Army knife doesn’t have the highly-desirable “tool for removing stones from horses hooves” does not preclude it from fulfilling its more quotidian functions well. The fact that your car can’t do 0-60 mph (0-95 kph, or 0-26 ms-1 if you insist) in less than 4 seconds, does not mean that it is incapable of getting you around town perfectly happily. Tools should be fit-for-purpose, not all-purpose. Unfortunately, sometimes business intelligence can be presented as capable of achieving the impossible; this is only going to lead to disillusionment with the area and to the real benefits not being seized. Also it is increasingly common for vendors and consultancies to claim that amazing results can be obtained with BI quickly, effortlessly and (most intoxicatingly) with minimum corporate pain. My view is that these claims are essentially bogus. Like most things in life, what you get out of business intelligence is highly connected with what you put it. If you want some pretty pictures showing some easy to derive figures, then progress in days rather than months is entirely feasible. But if you want useful insights into your organisation’s performance that can lead to informed decision making, then time is required to work out what makes the company tick, how to best measure this to drive action and – a part that is often missed – to provide the necessary business and technical training to allow users to get the best out of tools. Here my experience is that there are few meaningful short-cuts. Dissect corporate performance in ways that enable underlying drivers to be made more plain (our drop-off in profitability is due to pricing pressures in Subsidiary A and poor retention of mid-sized accounts in Territory B, compounded by a fall in the rate of new business acquisition in Industry Segment C). It is worth pointing out that a lot of the above is internally focussed, about the organisation itself and only tangentially related to the external environment in which it is operating. Some companies are successfully blending their internal BI with external market information, either derived from specialist companies, or sometimes from industry associations. However few companies are incorporating macroeconomic trends into their BI systems. Maybe that’s because of the confusion endemic in Economics that was referenced above. However there is another reason why BI is not really in the business of predicting overall economic trends. In the preceding paragraphs, I have stressed that it takes lot of effort to get BI working well for a company. To have the same degree of benefit for a nation’s economy, you would have to aggregate across thousands of companies and deal with the same sort of inconsistency in data definitions and calculation methodologies that are hard enough to fight within an organisation; but orders of magnitude worse. Nationwide (let alone global) BI would be a Herculean (and essentially impossible) task. Instead simplifying assumptions have to be made, and such assumptions do not generally lead to high-quality BI implementations; which are typically highly-tuned to the characteristics of individual organisations. There are of course organisations whose general profitability exceptionally depends on broad economic trends. These include the much maligned banks of varying flavours. The unique problem that many of these face is of leverage. While a 1% fall in economic activity might have a 1% impact on the revenues of a manufacturing company (in fact seldom is the relationship so simple), it might have a catastrophic impact on a bank, depending on how their portfolio is structured. To look at the simplest form of option, which pays out the differential between the market price and a floor of £50. If conditions in the economy drive the share price from £55 to £50, the regular shareholder has lost 9% of their investment; the option holder has lost 100%. So while both the shareholder and option-holder will have an equal chance of experiencing such a price-fall, the impact on them will be radically different (in this case by 91%). Like BI, derivatives are a very useful tool, however they also need to be used appropriately. For readers who are interested in this area, I recommend Neil Raden’s artcile: Wherefore Analytics on Wall Street? An Homage to Hy Minsky.